Eep is a prehistoric teenager with modern problems. Her father wants to protect her, but she views his protection as smothering. She introduces the movie by saying, “With every day comes a new beginning- a hope that things will be better. 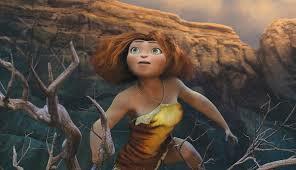 But not for me.” She explains that – to keep her safe – her father has her spend much of her life in a cave. 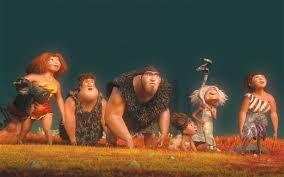 Grug and his family are cavepeople. Their world is dangerous. They’ve witnessed horrible things. Grug has responded by sheltering his family behind a wall (actually, within a cave) so that they can’t be hurt by the outside world. Many children in foster care, and many children in adoptive families have also created an emotional wall to protect their feelings from anticipated hurts. Grug’s wall was forcibly removed, and that might be meaningful to some viewers. As Grug learns to look for a better future, children may also be able to lower their walls and hope for better experiences. The movie encourages viewers to not hide and not fear the future. Grug is overly-cautious with his daughter; some writers have theorized that adoptive parents are often extra-careful because they’ve waited so long to be parents and because they feel judged by the system and their peers. Grug is a strong and selfless father who obviously puts his family’s needs over his own. He is the last to enter the cave, the last to eat at a meal, and the one to ensure others are safe, even at risk to himself. He does not complain about this, but seems to view it as a natural part of life as a father. His selflessness as a father is a rarity in movies; it stands in sharp contrast to the selfishness of Gru in Despicable Me. Grug’s family has a strong cohesive identity. The difficulties of prehistoric life make them bond together. They defend each other, hunt together, and they travel together. Grug is affirmed for “keeping us all alive.” Although he has struggled to express emotions, Grug invents the hug to show Eep that he loves her. Grug and Eep are also eventually able to verbally express their love for each other. Grug’s wife encourages him to be patient with Eep as she works through her feelings. Eep is a strong female character. Although she is less-than-cautious at times, she’s not without wisdom. Eep defends her new friend from her family, but also defends her family from her new friend’s judgments. Eep’s new friend, Guy, encourages her to believe that the future will not be frightening. Who Cried Wolf… If you caution your kids away from too many things, your words might start to bear less weight. There is a bit of a challenge with regard to the message the movie sends. Grug’s selflessness is shown, but not really mentioned. The turning point of the movie is that old-fashioned, sensible, and cautious Grug becomes wise enough to relinquish his leadership to a young man with innovative ideas. Grug is selfless, but the focus of the movie is that Eep is right, and Grug needs to change his old-fashioned overly-cautious ways. I find myself wishing that the film also made room for Eep to more fully acknowledge her father’s goodness; as it is, the movie seems to come alongside tweens and say, “You’re right. Your parents are a bit slow.” Parents might also not appreciate the movie’s message that Eep’s more-or-less boyfriend is smarter than her father. At least, that’s one way that the movie can be interpreted. 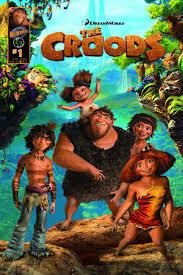 Another interpretation (This might be the only review to come up with two interpretations for The Croods…) is that the turning point of the movie is Grug moving away from a fear-based way of life (He originally counsels his family, “never don’t be afraid,”) and into an expectant, hopeful approach into the future. This interpretation is helpful, especially for kids in foster or adoptive families. Many kids respond to grief or loss by being afraid and putting up walls. 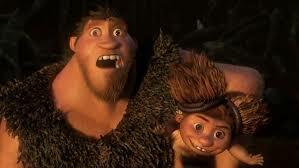 As Grug moves from fear to hope, kids might also be encouraged to let go of fear and embrace the future. And here’s the challenge: The first interpretation comes if a viewer identifies with Eep. The second comes if the viewer identifies with Grug. But kids watching the film might be more likely to identify with the teenager than the parent. A pivotal moment in the film occurs when Eep sneaks out of her house at night. This actually helps bring about the film’s happy ending. As a foster care social worker, I often worked with kids who were “runaway threats.” This film presents running away in a positive light. There were some scenes that I thought might be frightening to very young viewers, but in a theater full of young kids, I didn’t hear any crying. Some loudly whispered pleas to go to the potty, yes. But mostly, laughter. The potentially scary scenes: Characters are chased by animals; their neighbors are eaten by creatures (albeit humorously.) A swarm of locust-like birds completely skeletonize a whale-like creature. The mother-in-law tries to eat another person. A character pulls a knife on another. One character’s pet falls off a cliff, and we’re temporarily unsure of what happens to him. For a while, we are led to believe that Grug has died, sacrificing his life for the rest of his family. The family mourns his loss together. It’s a particularly sad moment, but after about 30 seconds, we learn that he’s all right. Grug has a difficult relationship with his mother-in-law. Although he protects her, he also appears to be gladdened by the thought of her dying. A character mentions being traded to her new husband. 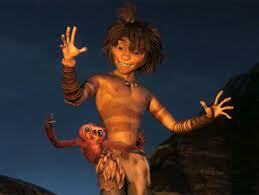 There is a lot of good to draw from The Croods. Families can watch it with young foster or adoptive children – the film will probably appeal most of all to kids between the ages of 5 and 12. The movie should be helpful to start discussions about a fearful or pessimistic view of the future, the “walls” that we sometimes build up, and the right role of a father. Why did Grug want his family to live in a cave? In what ways do people today sometimes make caves for themselves? What’s good about living in a cave? What do you miss out on by living in a cave? Grug wasn’t ready to leave his cave right away. His cave kind of got taken from him. Have you ever felt like your cave was taken away? Do you feel like you live in a cave sometimes? What makes Grug a good dad? What parts of him aren’t so great? Find this article helpful? Why not follow Adoption at theMovies on Facebook, and always know when new reviews are coming! If you're an adult, then you might find this movie to be just ok, but it's more than likely your kids will like it, so it might be a good way to get out of the house. Nice review Addison. You write such great reviews. This sounds really cute and I love the way you compare the cave walls to emotional walls.